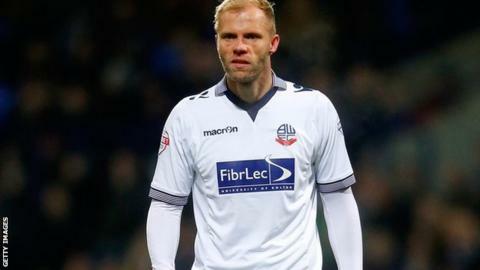 Eidur Gudjohnsen's first goal since returning to Bolton gave them a point from an entertaining game with Leeds. The visitors made a dream start when Rodolph Austin slotted home a third-minute penalty after Sam Byram was fouled by keeper Andy Lonergan. Luke Murphy fouled Darren Pratley in the area to leave Gudjohnsen to level from the spot with his first goal for Bolton since May 2000. Gudjohnsen returned in December, over 14 years after leaving for Chelsea. Bolton boss Neil Lennon had said in the build up to the game that his players must not let the prospect of facing a trip to Liverpool in the fourth round of the FA Cup distract them from the league, but they made a dreadful start. Austin hammered home from the spot after Lonergan had upended Byram in the area and the hosts were almost 2-0 down inside 10 minutes when Steve Morison drew a fine save from the Bolton keeper. The Trotters started with experienced duo Gudjohnsen and Emile Heskey, both 36, in attack and the Iceland international came close to levelling for the hosts when his 20-yard free-kick went just wide. Bolton continued to grow into the game as the half progressed and Leeds were indebted to keeper Marco Silvestri for a good save from Liam Trotter's shot. Gudjohnsen equalised for the hosts after three minutes of the second half after Murphy fouled Pratley in the area. Wanderers were dominating, but Leeds still looked threatening on the break and Luke Murphy went close from the edge of the area after a swift counter attack. Gudjohnsen came close to a second, but was denied by a fantastic block by Leeds defender Liam Cooper. The visitors nearly nicked it themselves when Byram was denied from close range by Lonergan, but they had to settle for a point that means they remain winless since 29 November and are just two points clear of the bottom three. "It was a fair result. While I'm disappointed, I am sort of satisfied because we didn't play anywhere near our best. "We got off to a poor start and I'm not convinced it was a penalty - in fact I'm not convinced ours was a penalty either. "We never really imposed ourselves on the game and we are missing creativity, so we need to get some bodies in and I think it's important we do that this month." "We looked more balanced with and without the ball, and I thought we looked a threat going forward. "Sam Byram and Lewis Cook were excellent and I thought Morison played his part and led the line well for us. "The ball didn't come straight back like it did at Sunderland (last week), so there were lots of positives." Match ends, Bolton Wanderers 1, Leeds United 1. Second Half ends, Bolton Wanderers 1, Leeds United 1. Rodolph Austin (Leeds United) wins a free kick on the right wing. Attempt missed. Luke Murphy (Leeds United) right footed shot from outside the box is close, but misses to the left. Assisted by Gaetano Berardi. Substitution, Bolton Wanderers. Tom Walker replaces Eidur Gudjohnsen. Substitution, Leeds United. Alex Mowatt replaces Casper Sloth. Corner, Leeds United. Conceded by Andy Lonergan. Attempt saved. Sam Byram (Leeds United) right footed shot from the centre of the box is saved in the top right corner. Assisted by Lewis Cook with a through ball. Attempt missed. Gaetano Berardi (Leeds United) left footed shot from outside the box misses to the left. Assisted by Sam Byram. Attempt blocked. Matt Mills (Bolton Wanderers) header from the centre of the box is blocked. Assisted by Liam Feeney with a cross. Attempt blocked. Eidur Gudjohnsen (Bolton Wanderers) right footed shot from the centre of the box is blocked. Assisted by Tim Ream with a cross. Substitution, Bolton Wanderers. Craig Davies replaces Liam Trotter. Attempt missed. Casper Sloth (Leeds United) right footed shot from the left side of the box is high and wide to the right. Assisted by Gaetano Berardi with a cross. Delay in match Sam Byram (Leeds United) because of an injury. Attempt missed. Gaetano Berardi (Leeds United) right footed shot from the right side of the box misses to the left. Assisted by Lewis Cook. Substitution, Bolton Wanderers. David Wheater replaces Dorian Dervite. Offside, Bolton Wanderers. Emile Heskey tries a through ball, but Eidur Gudjohnsen is caught offside. Hand ball by Steve Morison (Leeds United). Offside, Leeds United. Charlie Taylor tries a through ball, but Rodolph Austin is caught offside. Hand ball by Luke Murphy (Leeds United). Attempt missed. Luke Murphy (Leeds United) left footed shot from the centre of the box is close, but misses to the right. Assisted by Sam Byram.